Thousands of people will suddenly find themselves right in the middle of an extraordinary display of Christian activity at Norwich this weekend. For as they enter the city’s highly prestigious Forum venue, they will come face-to-face with no fewer than 45 Christian organisations, who will be presenting their work in a major exhibition. And as they walk through to the open space on Millennium Plain, shoppers and visitors will be treated to music from the likes of Norwich District Methodist Choir, rock band Brokenfor and musician David Fitzgerald. 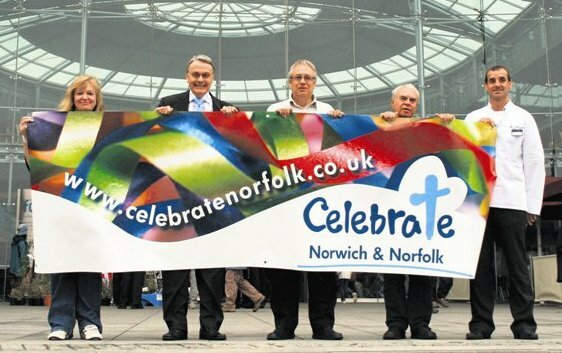 From 10-12 June, the city centre will be filled with these living demonstrations of local church life for the Celebrate Norwich & Norfolk festival. Now an established event, it offers a range of activities throughout the three days. Events also include training workshops and conference, a high-profile dinner, café church, sporting quiz and a Global Day of Prayer event. 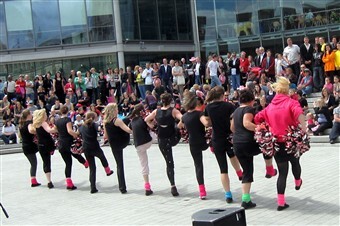 Choirs, bands, musicians, street entertainers and artists will all be taking part. Other partner events include a charity concert at Norwich Cathedral featuring the South Wales Male Choir. The Diocese of Norwich will be holding a training day for young church leaders. The main event starts at 9am on Friday on Millennium Plain with a short service outside the Forum. ‘We need the support and ideas of as many different Christian groups as possible to make a real impact,’ said John Betts. Norfolk has long-standing links with HOPE. A team from North Walsham was among those who attended a royal reception at Clarence House during Hope08, when Prince Charles paid tribute to the initiative. Worldwide security in my own examination is viewed as the key set up by the administration to ensure the natives of a nation against any assault either broadly or trans nationally around the world as the case possibly.